After reading all the programming basics, we are ready to sum up the information and write the first program. There is still a lot to learn, and the minimum required code in order to make a Java program contains elements that we didn’t mention yet. For now – just ignore anything that is not mentioned here – we will explain everything as we continue. 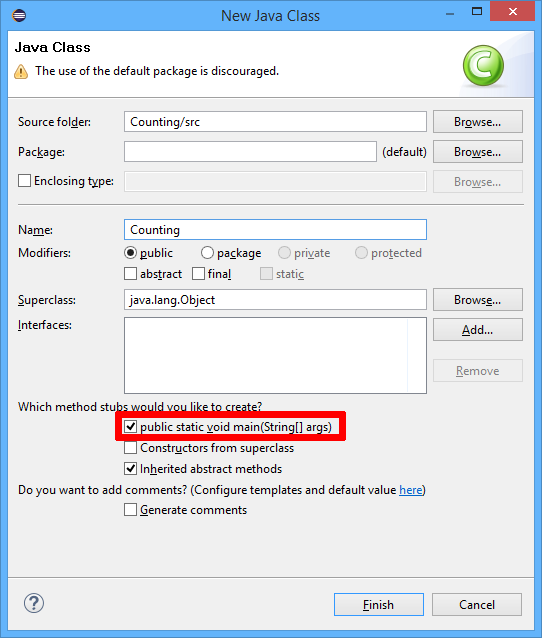 Note that all our instructions are compatible with Eclipse IDE for Java Developers. You can find the installation instructions here. 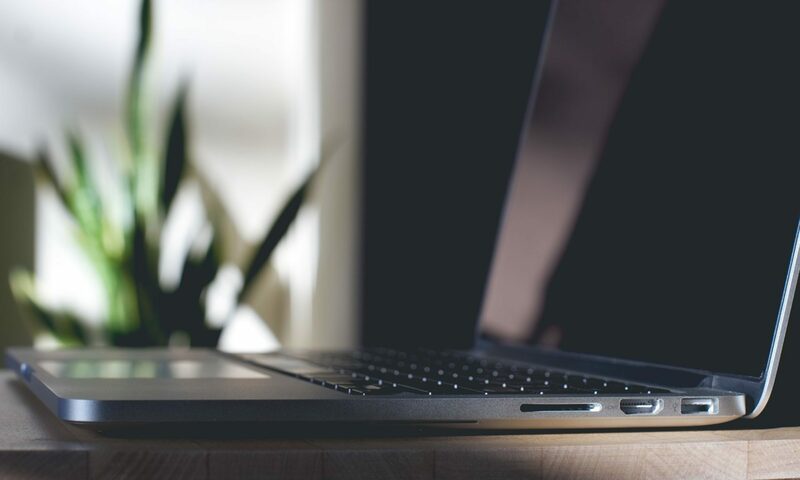 If you are using a different IDE – you’ll need to do the required steps using your IDE. 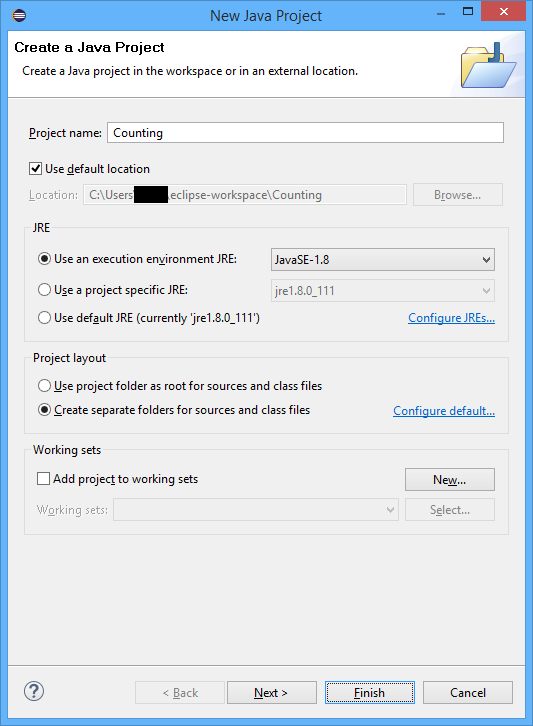 First – start Eclipse IDE. 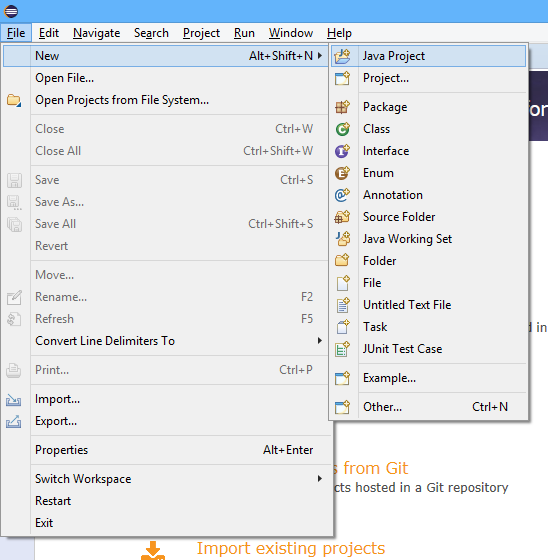 Create a new Java project by clicking on the “File” menu, then “New”, and then “Java Project”. 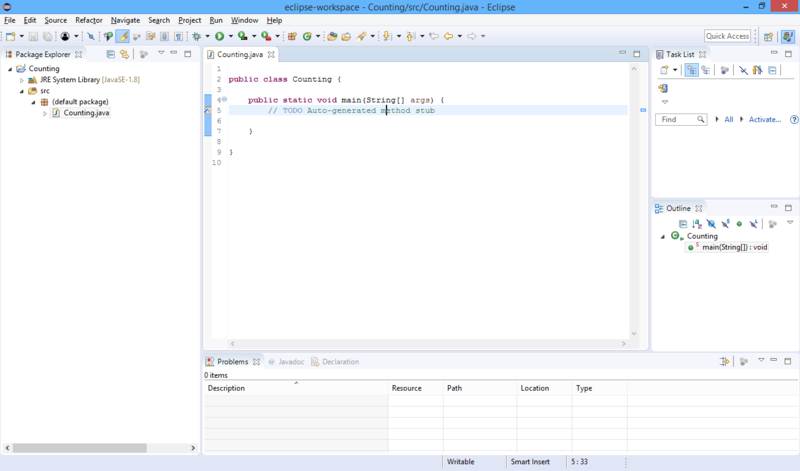 Set the name of the class to be “Counting”, and check the “public static void main(String args)” option. This will create our program entry point. Now we are ready to write the first program which will be our Counting program. We will implement the counting flowchart step by step. Our entry point is the “main” function that was automatically generated for us when we added the class to our project (we will explain what are classes and functions in the next pages). The next step is the input of the Start, End and Step parameters. In this example – we will use constants instead of actually get them as input. You can see that we already opened the “while” scope by adding the left curly bracket at the end of our while condition. Now – we will write the commands that need to be executed inside the while condition, which are “print counter” and “increment counter by step”. 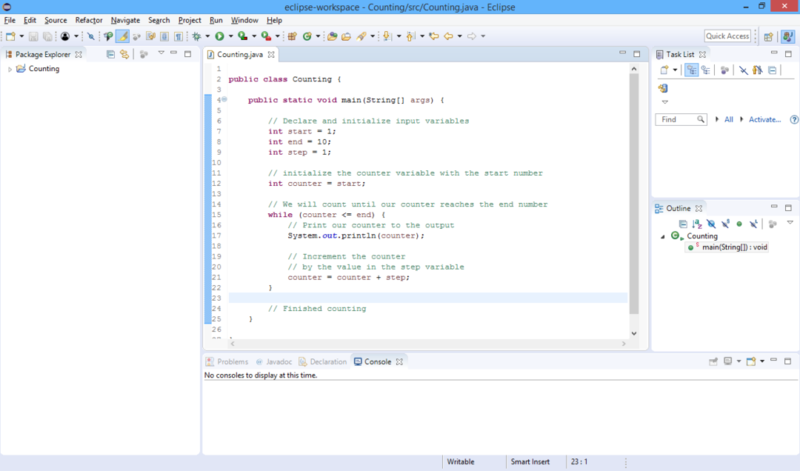 We will use Java’s System.out in order to write our counter as our program’s output. The System.out has a “println” function that writes a variable to the output, and adds a new line – so we will print each one of our count numbers in a line of its own. 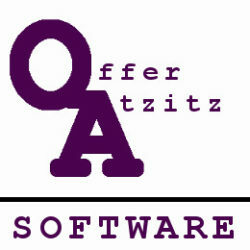 We will use the assignment and addition operators in order to increment our counter. The above statement says: Add the value of step and the value of “counter” and put the result in “counter”. 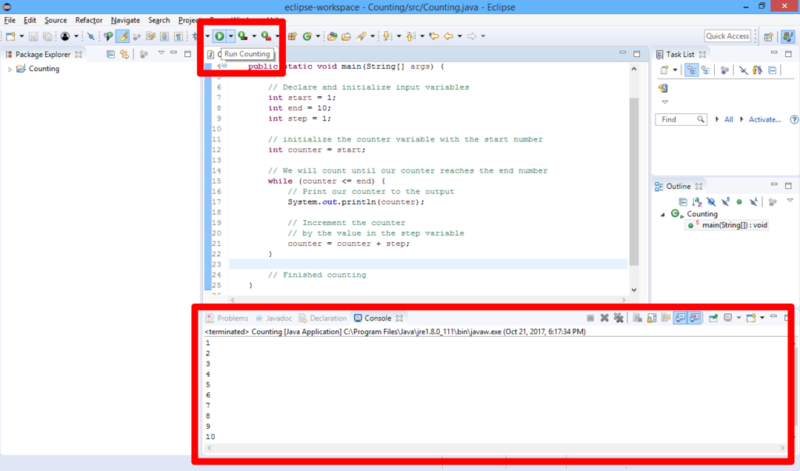 The plus sign instructs the program to add the two values and the equal sign says to put the result of what is right to the equal sign to the variable which is left to the equal sign. We end the “while” scope by adding right curly bracket. If we will not add anything after the “while” scope – the program will just finish as we reach the end of the scope of the “main” function. 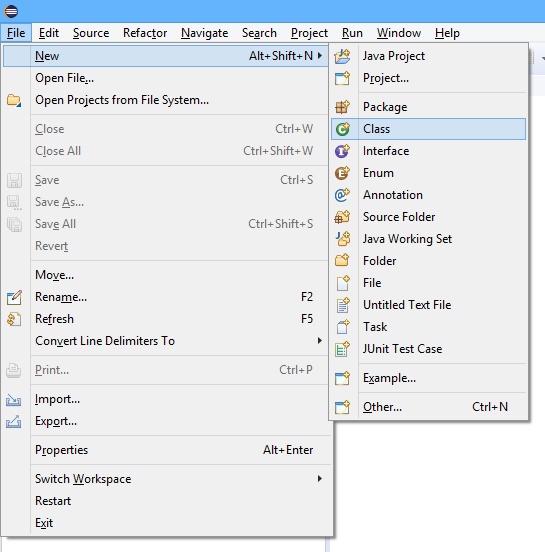 The Eclipse IDE allows you to run the program by clicking on the “Run” button, which is the button with “Play” sign inside a green circle. 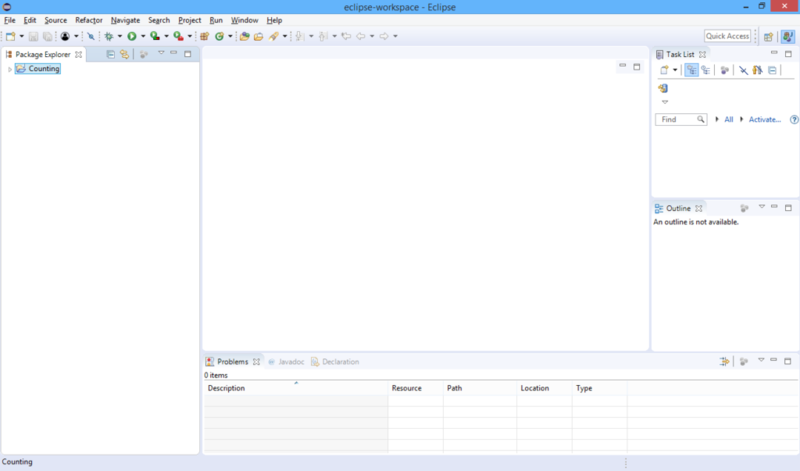 After clicking on the “Run” button the program will run, and its’ output will be written to the “Console” tab in the lower pane of the window. This sums up the programming basics section. We will continue to use, learn and practice these basics, while continue to learn more programming concepts and practices.